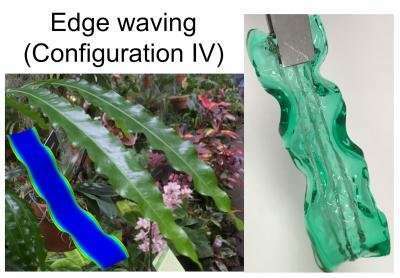 Scientists from Nanyang Technological University, Singapore (NTU Singapore) and Carnegie Mellon University in the U.S. have discovered how mechanical forces can influence the shapes of plant leaves and flower petals. While the genetic and biomolecular mechanisms that give rise to complex 3-D shapes in plant organs have been widely studied, the role of biomechanical factors is unclear. 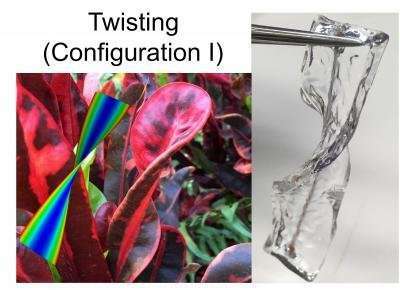 In their latest paper published in Proceedings of the National Academy of Sciences (PNAS), the researchers combined quantitative measurements of live plants with computational simulations to show how mechanical stress and deformation influence the shape of plant leaves. Growth of a leaf is modulated by its growth factor, a natural substance capable of stimulating growth, proliferation, and differentiation in living cells. Where a leaf has higher growth factor concentration, (typically at the part near the leaf edge), it grows faster, resulting in additional stresses that eventually bend or deform a leaf into the different 3-D shapes it can take. The authors constructed a phase diagram illustrating how each of four common leaf geometries—twisting, helical twisting, saddle bending, and edge waving—are associated with specific combinations of the parameters. These findings help to explain and give insights into how plant organs are shaped, providing the scientific understanding needed to generate bioinspired 3-D structures in soft materials such as hydrogels.